A new study offers clues on the origins of life, providing data to support the idea that the 10 amino acids believed to exist on Earth around 4 billion years ago were capable of forming foldable proteins in a high-salt (halophile) environment. Tallahassee, Florida — A structural biologist at the Florida State University College of Medicine has made discoveries that could lead scientists a step closer to understanding how life first emerged on Earth billions of years ago. Professor Michael Blaber and his team produced data supporting the idea that 10 amino acids believed to exist on Earth around 4 billion years ago were capable of forming foldable proteins in a high-salt (halophile) environment. Such proteins would have been capable of providing metabolic activity for the first living organisms to emerge on the planet between 3.5 and 3.9 billion years ago. The results of Blaber’s three-year study, which was built around investigative techniques that took more than 17 years to develop, are published in the journal Proceedings of the National Academy of Sciences. The first living organisms would have been microscopic, cell-like organizations capable of replicating and adapting to environmental conditions — a humble beginning to life on Earth. 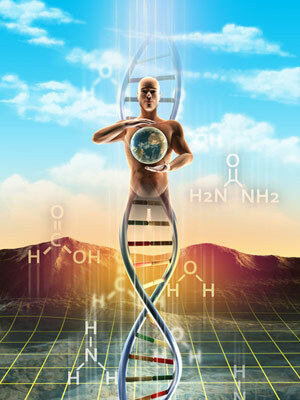 The widely accepted view among scientists is that RNA, found in all living cells, would have likely represented the first molecules of life, hypothesizing an “RNA-first” view of the origin of living systems from non-living molecules. Blaber’s results indicate that the set of amino acids produced by simple chemical processes contains the requisite information to produce complex folded proteins, which supports an opposing “protein-first” view. Another prevailing view holds that a high-temperature (thermophile) environment, such as deep-ocean thermal vents, may have been the breeding ground for the origin of life. Without the ability to fold, proteins would not be able to form the precise structures essential for functions that sustain life as we know it. Folding allows proteins to take on a globular shape through which they can interact with other proteins, perform specific chemical reactions, and adapt to enable organisms to exploit a given environment. Comet and meteorite fragments, like those that recently struck in the Urals region of Russia, have provided evidence regarding the arrival of amino acids on Earth. Such fragments predate the earth and would have been responsible for delivering a set of 10 prebiotic (before life) amino acids, whose origins are in the formation of our solar system. Today the human body uses 20 common amino acids to make all its proteins. Ten of those emerged through biosynthetic pathways — the way living systems evolve. Ten — the prebiotic set — can be made by chemical reactions without requiring any living system or biosynthetic pathway. Scientific evidence exists to support many elements in theories of abiogenesis (the emergence of life), including the time frame (around 3.5 to 3.9 billion years ago) and the conditions on Earth and in its atmosphere at that time. Earth would have been made up of volcanic land masses (the beginning of the formation of continents), salty oceans and fresh-water ponds, along with a hot (around 80 degrees Celsius) and steamy atmosphere comprising carbon dioxide and nitrogen. Oxygen would have come later as a by-product of green plant life and bacteria that emerged. Using a technique called top-down symmetric deconstruction, Blaber’s lab has been able to identify small peptide building blocks capable of spontaneous assembly into specific and complex protein architectures. His recent work explored whether such building blocks can be comprised of only the 10 prebiotic amino acids and still fold. His team has achieved foldability in proteins down to 12 amino acids — about 80 percent of the way to proving his hypothesis. If Blaber’s theory holds, scientists may refocus where they look for evidence in the quest to understand where, and how, life began. “Rather than a curious niche that life evolved into, the halophile environment now may take center stage as the likely location for key aspects of abiogenesis,” he said. Co-authors on the PNAS paper are Liam M. Longo, an FSU graduate student, and Jihun Lee, a former postdoctoral researcher now at the National Institutes of Health. 6 Comments on "New Data Offers Clues on the Origins of Life"
Just read the works of Jakob Segal and you’ll see that these are not the first people to arrive at these conclusions. Let’s just hope their views will not be shunned this time around. It could very well be so,GOD knows. And where did the amino acids come from and who made that possible and so on and so on, in other words, how were all the elements and checmicals needed created. they appear sporadically under certain conditions prevalent on earth in ealier times. This has already been proven more than half a century ago. Segal even points out why some left-handed amino-acids are more common than right-handed ones (less energy needed). Hey, fellows, if totally random interaction between chemicals produced life billions of years ago, how come something so “simple” as a primeval cell hasn’t been duplicated by you geniuses in the laboratory? Maybe you guys are barking up the wrong tree.